Uh huh. We've even got the verb right: to pay. Which is more intimate, the public or private paying of attention? And then, what value does one place on intimacy? As in a money-economy, people do various things & have various goals & philosophies concerning how best to spend their limited currency. Some are virtuously thrifty. Others make a flashy show of overtipping. Others can't seem to save even enough to scrape by. Some are sanctimonious about it. Some feel better when they whine about it (& we want them to feel better). Some just enjoy being boisterous, because it is their favorite subject & they consider themselves expert. &, sadly, others run around like bankrobbers sticking everybody else up for it. To return to value (because that's really something): value is most certainly personal & intimate. It becomes insitutional only by bringing enough individuals around to its side. "You" & "I" value some things alike & some things different. Also, I may not value what you value, but I feel an imperative to value that you do. I'm just like that: interested in you. Possibly even nosy. The currency of our attention is private & individual. Or it's public & institutional. Or it's some fluid combo. Or god how blatant it is. Or look, there's goes a really cute dog! less of a response than a riff on similar, really. more, perhaps: the attention i give to a poem/book/something else in private is different in quality than the attention i direct to it by making my private attention public. in other words: by pointing. i value the private kind more, in the way people cherish things they keep private but still like things they show around. it's a reader's type vs. a reviewer's type. some kind of reverse-alchemical change seems to happen when private attention becomes public pointing. i am thinking about the reasons for this. since pointing can be a gift, it is subject to motive (on a scale from genuine excitement to mere flattery on the positive end, to ridicule/humiliation/cruelty on the negative end). when the object of attention is not object but human i cannot help but anticipate that person's reaction to my attention. that impacts/informs/reveals my action, and my motives include this awareness. i am speaking from a payer's POV, not a (what?) payee's. there are several reasons (along another similar but differently appointed scale) one might/does want to draw attention to oneself (or the objects one creates; "the work"). just as there are many modes (another scale) in which to do it: "i have made/done this and am proud of this and you might be interested in this." vs. "hey, everybody look at me. i don't care why!" ...stilll thinking. because...positive pointing (the public paying of positive attention) can be "pure" of motive (conveying genuine excitement or enthusiasm) OR impure of motive, say self-aggrandizing or expert-positioning. the paying of negative attention is sometimes pure (say, in the case of a bad but fairly argued book review, for instance) OR impure (pointing with the intention to shame/humiliate etc.). anyway, uh, thanks for pointing. The impossibility of loving everyone must not interfere with one's attempts to (at very least) love onself. And vice versa. I am so too busy. There are things that I want very much to do, now. * Finishing the unfinishable last hurrah book. Still. 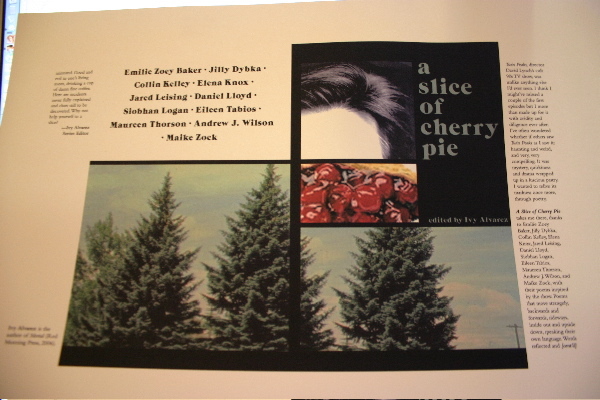 * Finish assembling the cherries & getting all the preorders & contributor copies in the mail. Then come the things I would like to do now, if not sooner. The things with covers & pages that came in the mail. Things like Organic Furniture Cellar & The Anger Scale & a whole box from Salt! So now, if 1/3 of poets will please respond that'd be awesome. The book is being closed this weekend regardless, with or without, because I really really really need to move on. Friends forgive even your worst typos, your most mangled syntax, the flubs of your ungrammatical heart. Save the samples to your iPod. Tonight in New Haven . . .
. . . should I survive the train and mythical burger (& really, there's no reason to suspect I won't), I won't quite be reading a "whole new set of wholly new poems," but close. Been working on revisions to the the "For Girls" poems from April's NaPoWriMo, which have never been performed in their full-bottomed bustleness, as well as some incidental gifts of poems from the ether, and at the other end of the scale will read some unfiltered raw biomass from the notebooks, such as a poem named "Tony Danza." Which is not to say the "For Girls" series is completed (thanks to Ian). But as it stands, I mean, the girls in a semicircle awaiting their number on their dance cards. If anybody shows up, that is. If not, we shall sing & mimic our favorite tropical birds. Which could also be fun. Can I interest you in a A Slice of Cherry Pie, Sheriff? 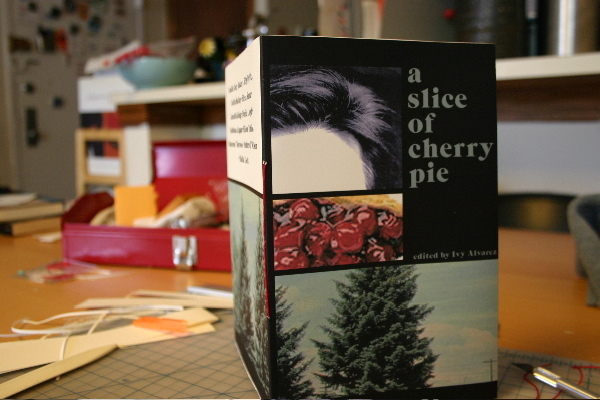 Click for the documentary slideshow: The Making of A Slice of Cherry Pie. 5.5 x 8.5, 24 pp. Go here to order in the US ('bout 45 or so left of the first printing, thanks to preorders). Or here to order the UK version. Ivy also hosted an online launch party on Friday, and you can still catch some of the festivities here. & Ivy's also accepting submissions for Deranged, the next chap in the series. So send her your poems inspired by Lynch's Lost Highway and/or Mulholland Drive before December 31, 2006. Letterpressing in the press . . . I'm mentioned briefly in this profile of Emily Barton in the NJ Star-Ledger today. (I hear there are pics in the printed version, too.) We did get all her wedding invitations done finally, you'll be happy to know. & hey, you can get her new book here. Then back here to work some more on the Cherries. Most of the covers are printed and the interior just needs a few minor adjustments before I fire up the lasers. Ivy has announced that she'll be hosting an online release party tomorrow for the UK version of A Slice of Cherry Pie. Details here. You can still preorder the US version here, and the UK edition will be available tomorrow here. One of my personal heros, for real. A real Texan. In the meantime, I think Shaman Drum bookstore still has copies. (Hi, Ray!) And they have an online store. But I'm going to try to write/finish whole new sets of wholly new poems for each of these readings. I've got exactly a week before New Haven. My new book DEVIANT PROPULSION is finally out! For the price of the book, ordered directly through me, HERE IS WHAT YOU WILL GET! contact me TODAY at CAConrad13 [at] aol [dot] com to reserve your copy! HESITATION IS A BAD THING THAT YOU NEED TO GET OVER!!!!
. . . in the flow of the word faucet, by now obvious. Chipping away at the Lingering Volume. We're so close. Owed one letter re: poems that's going out (finally) today. Will begin another this week. Otherwise reading fiction meant for "young persons," of which I am apparently still one. Have decided to try something altogether new. Will let you know if I succeed. The weather necessitates a shifting, a sifting through closets. Oh, and I have some readings coming up. "I have actually written 30 books (not 25). Thank you very much." I get to go back to the studio today. Helping some friends with their wedding invitations. It's such a lovely excuse!